Smuggle some raw ebony to Ald'ruhn. Will you deliver the Ebony to this smuggler? Travel to Ald'ruhn to deliver the ebony (to complete for Helvi) or Vivec to report the smuggling (to help Curio). Give the ebony to Drinar Varyon. If you went to Vivec. Go to Buckmoth Legion Fort and give the ebony to Segunivus Mantedius. Odral Helvi in the Governor's Hall in Caldera will ask you to take five pieces of raw ebony to Drinar Varyon in Ald'ruhn. If you don't already know him, Drinar Varyon is a smuggler and smuggling raw ebony is illegal. If you choose this route, travel to Ald'ruhn and find Varyon in his house to deliver the ebony for 500 gold. Afterwards, return back to Helvi to finish this final quest with him. If you don't wish to become part of an illegal ebony ring, take a side trip to see Crassius Curio, who will tell you to take the ebony to Segunivus Mantedius at Buckmoth Legion Fort instead. To convict Odral and his fence, you have to convince Segunivus first. If you lie and say you are a licensed trader then he will tell you to go about your business. If you say Odral Helvi made you deliver it and then lie about who you are delivering to, he will not believe you. If you tell the truth and hand over the ebony, both Varyon and Helvi will be taken care of. Return to Curio who will give you two enchanted rings, a Dire Shardbolt Ring and an Eye-Maze Ring, for doing the right thing. 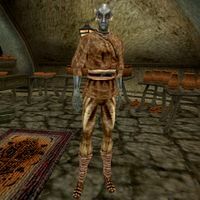 After completing the Shipment of Ebony quest for house Hlaalu, and turned in the ebony to Segunivus Mantedius, Odral and Drinar will be removed from the game. This will not affect Drinar's other related quest, Dwemer Artifacts at Drinar Varyon's Place. You can kill both Odral and Drinar before talking to Segunivus without affecting the reward. Crassius still says Odral is on a prison ship. If you talk to Segunivus, you don't actually need any ebony in your inventory to cause the quest to update. Simply drop the five pieces you have somewhere then pick them up again afterwards for an extra bonus. This will trigger another bug, which reduces your encumbrance value as if the ebony had been removed from your inventory. 10 Odral Helvi asked me to deliver five pieces of raw ebony to Drinar Varyon in Ald'ruhn. 20 Crassius Curio asked me to deliver the ebony to Segunivus Mantedius at Fort Buckmoth. 50 I delivered the ebony to Drinar Varyon. 60 I delivered the ebony to Segunivus Mantedius. Odral Helvi will soon be arrested. 100 Finishes quest Odral Helvi thanked me for delivering the ebony. 110 Finishes quest Crassius Curio thanked me for delivering the ebony to Segunivus Mantedius and getting Odral Helvi arrested. This page was last modified on 12 February 2017, at 03:51.